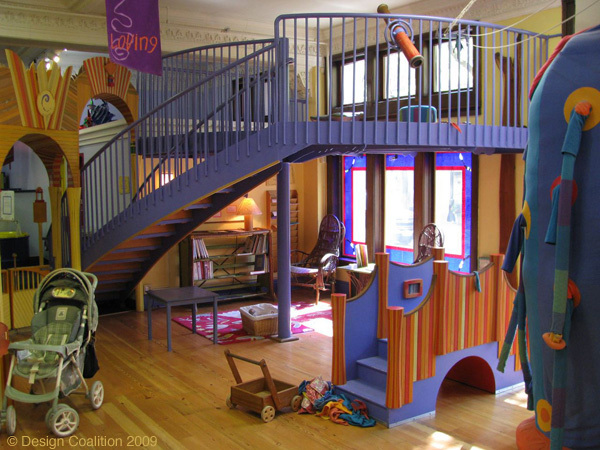 In 1999, Design Coalition helped the Madison Children's Museum (MCM) create it's award-winning First Feats exhibit (see photos below), which celebrates the first years of a child's life with a homey feel and a safe environment full of rich experiences. It was the first such exhibit in the nation to accomplish this with artistic and natural, non-toxic materials throughout. 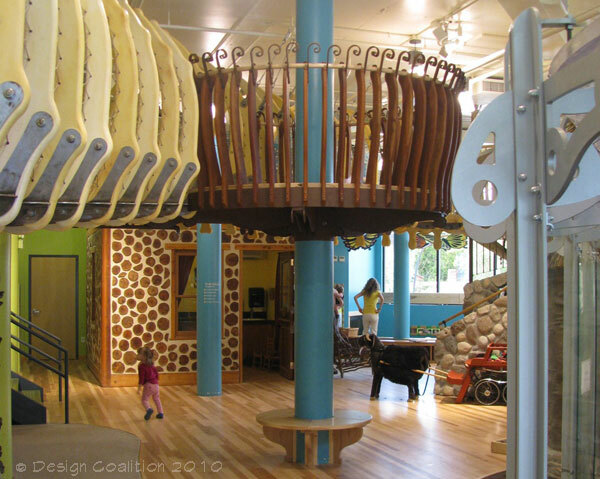 In August 2010, Madison Children's Museum opened it's new museum. 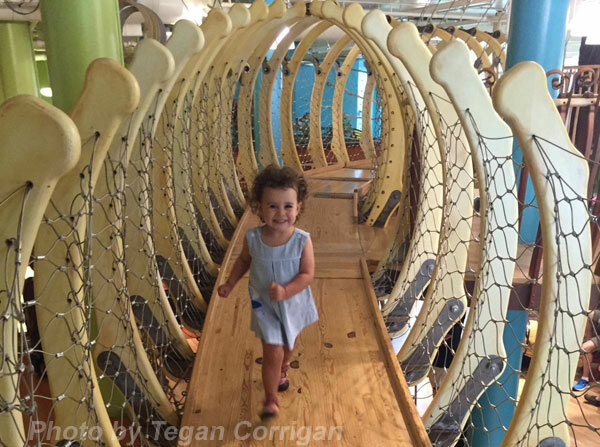 The new early-learning exhibit is about four times larger. It has a new name - the WilderNest - but has the same goals. The WilderNest exemplifies the concept of MCM's exhibits as practical art. 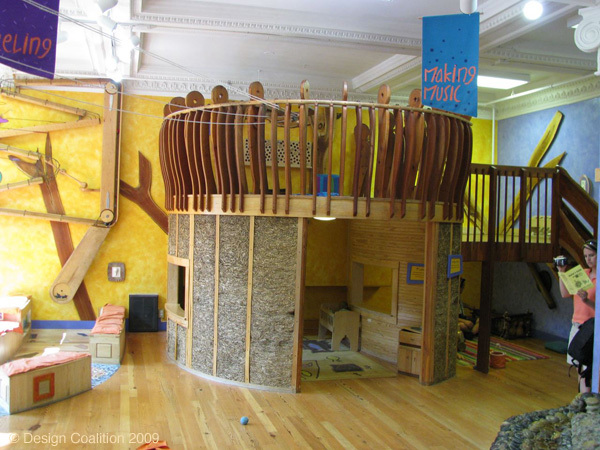 There is integration between careful age-appropriate design for children, high artistic quality by local craftspeople, and thoroughgoing sustainability. Locally-sourced, recycled, re-used and creatively re-crafted elements are to be found throughout. The WilderNest is designed as a community at a child's scale, complete with buildings arranged around a "village square". Above, from left to right: the Stone Grotto, the Music Hut, the Dress-up Hut and the Water Dome. Below, from left to right: Baby Nest and Troll Bridge, and overhead the Treehouse and Crow's Nest, connected via the suspended Skeleton Bridge. 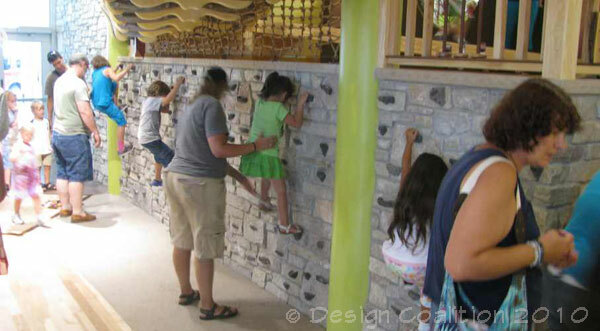 How do you provide a challenging, but still reasonably safe, rock-climbing experience for young children? Answer: horizontally. We took advantage of a five-foot level change between the floors, and the Museum chose a well-padded natural wool landing surface. Traversing the Skeleton Bridge, hanging from the sky-ceiling. 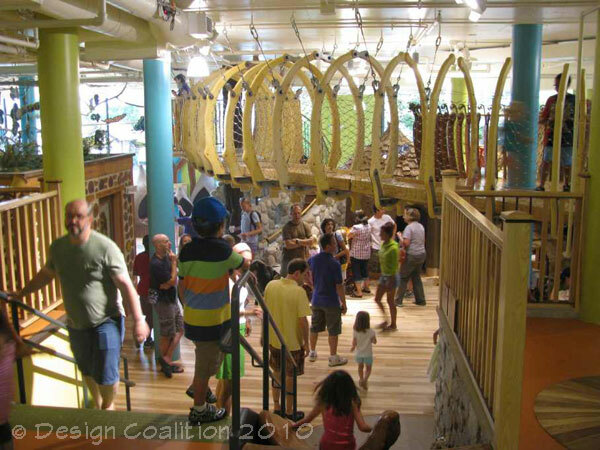 One Museum staffer described our design, "as if the villagers had re-purposed a giant cyborg snake as a skywalk". The railing balusters of the Crow's Nest are among the many elements that were re-used from former Museum exhibits. opened in April of 1999.